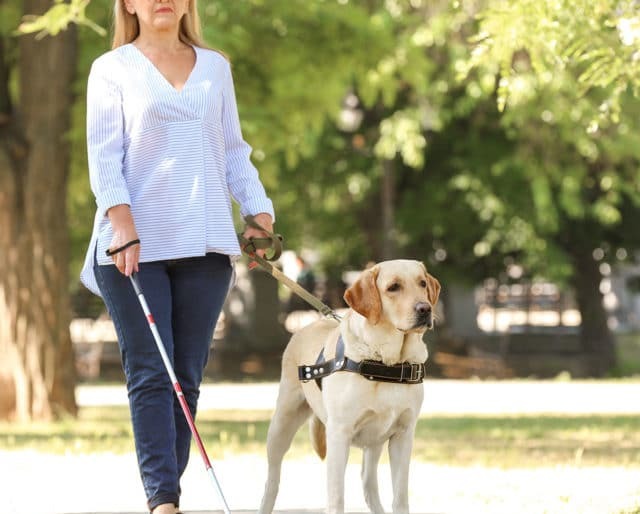 Guide dogs provide opportunities for social interaction and greater independence for legally blind adults. International Guide Dog Day pays tribute to the dogs who do this impressive work. Guide dogs help the visually impaired make their way through the world while offer love and comfort in so many ways. References to guide dogs date back to at least the 16th century, so for the hundreds of years of service that these faithful companions have provided, we say thank you on April 24 (the last Wednesday in April). Guide Dogs of America, founded over 70 years ago, sponsors this event. The ADA established legal protections for those using dogs as service animals. Dorothy Harrison Eustis and Morris Frank started The Seeing Eye in Tennessee. Guide dogs helped German soldiers following World War I. For one thing, guide dogs recognize whether or not a command would put their handler in danger and learn to disobey such instructions. That’s not an easy thing to teach! Several organizations throughout the world train guide dogs and match them with people. Like other nonprofits, they could benefit from your time and/or donations. Not all dogs who begin training for this task make it all the way. Those who don't — require a forever home. Note: There's a long waiting list for these dogs, so prepare your application early. That's because of their short coat, gentle temperament, willingness to help, and overall health. Research shows that guide dogs offer increased mobility, boost a person’s confidence, provide companionship, and can even lead to increased social interaction. Common guide dog names include Max, Charlie, and Buddy for males, and Bella, Lucy, and Daisy for females. They can keep their handlers from bumping into objects and harming themselves — by determining an obstacle's size and shape. You shouldn’t feed or pet a guide dog without permission, as it could distract the animal when it is attempting to perform important work. More than 140 million people in the United States alone are blind or suffer from some sort of vision impairment. Properly trained guide dogs keep them remain safe and independent by helping them navigate everyday obstacles. Guide dog training can be an expensive and time-consuming process. It can take up to two years and $25,000 to fully train a single service dog. In addition to giving folks an opportunity to recognize the work of guide dogs themselves, International Guide Dog Day lets us also offer a tip of the cap to the dedicated men and women who train them. Dogs are called “man’s best friend for a reason. People all over the world cherish their beloved canine companions, whether they are specially trained as service animals or not.